Music is your passion. It lifts you up when you’re down and drives you towards success, particularly when you’re working out at the gym or going for long runs. But it’s almost impossible to immerse yourself in music when your earbuds are hurting your ears, falling out, or letting distracting sounds in. These issues primarily stem from the silicone tips on your earbuds. They offer decent comfort when you first put them in, but this only lasts for a short time. Sooner or later, this material will start to wear on your ears, and you’ll have to pull your buds out to recover for a few minutes. Silicone also can’t react to changes in your ear’s shape, which means that your earbuds will frequently slip out and bring your exercise routines to a screeching halt. Worst of all, silicone isn’t thick enough to properly isolate sound, forcing you to endure unwanted noises during your workouts. Comply™ Sport Pro 500 foam tips are specifically designed to keep your earbuds in place regardless of which intense sport or activity you’re participating in. These high-quality tips are made with patented viscoelastic memory foam that offers unbeatable fit, comfort, and sound isolation. It’s the best earbud tip on the market for professional athletes, fitness buffs, and anyone with an active lifestyle. Popular earphone brands compatible with 500 core size earbuds include AKG, JBL, Ultimate Ears and more. These brands produce some of the highest-quality audio tech available—why compromise high-fidelity sound with shoddy eartips? Stop leaking sound and start locking it in. Hear the music for what it’s worth and get the most out of your finely tuned earphones. The Perfect Fit for Intense Workouts: Believe it or not, your ear is constantly responding to alterations in temperature and jaw position, resulting in small changes to its size and shape. To guarantee that your earphones won’t slip out during strenuous activity, you need quality tips that can adapt to these factors. 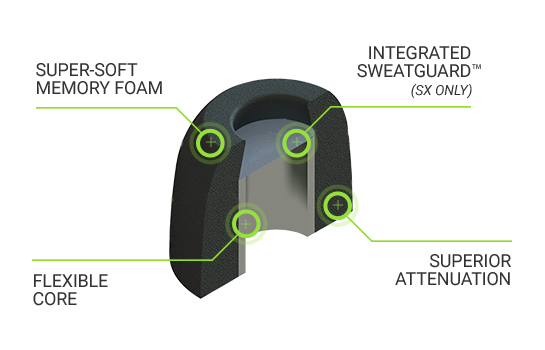 Comply’s patented memory foam actually expands to fill the unique shape of your ever-changing ear canal, forming a perfect customized fit at all times. Our tips are made from Comply™ Foam, an incredible material that’s actually 10 times thicker than silicone and activated by body heat, providing superb grip during even the most intense workout and jam sessions. Best of all, the extra thickness of tip products provides a substantial increase in sound isolation, blocking out external audio while sealing in the smooth sounds of your content. With the Sport Pro 500 series, you can shut down the sounds of fellow athletes, singing birds, or any other distractions, and simply lose yourself in the music. Maximized Comfort: Do away with constant breaks in your routine to rest irritated and aching ears. Comply™ Foam tips are 30 times softer than standard silicone. That makes them 30 times more comfortable than standard tips. The outstanding softness of Comply tips will help you combat earache and pain from prolonged earbud use too. With the Sport 500 series, you’ll never need to worry about ear fatigue during workouts again. New and Improved SweatGuard™ Protection: Whether you’re trudging through the elements on outside runs or hitting the weights at the local gym, workouts can get messy. To protect your earbuds from moisture damage, we invented the SweatGuard™. These acoustically-transparent filters are built within each tip to keep excess moisture, sweat, and earwax out of the earphone’s soundport. They’re a great choice if you want peerless durability for your high-end earphones.